SQLCMS - A CMS for SQL Server databases that you or your clients can use! Adapts to changes in your schema. SQL CMS is a Multi Award Winning web based Content Management System (CMS) for Microsoft SQL Server. SQL CMS is designed to be very simple to use, it was built with the end user in mind so is perfect for developers or their clients. SQL CMS generates a tailored CMS for any SQL database, letting you edit, insert, delete or search any data and execute any stored procedures in the database. SQL CMS requires no coding whatsoever and is highly configurable. SQL CMS is available free as a trial for 14 days. For continued use you will need to purchase a license. SQL CMS reduces the time to develop content management systems for SQL databases from months to a matter of minutes. 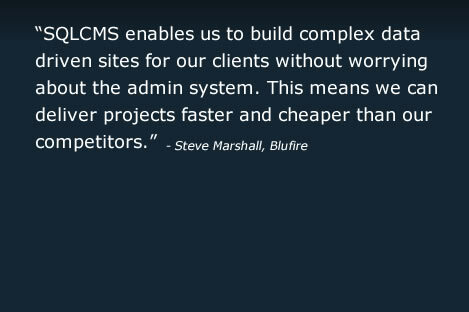 Cost savings from using SQL CMS can typically be from $2000 to $50,000+. The CMS is designed to be used by you or re-sold on to your clients so they can easily manage their own database content. Deliver projects FASTER and CHEAPER than your competitors! SQL CMS builds an extremely easy to use admin system for any SQL database - letting you concentrate on the front-end and business logic of your project. SQL CMS Adapts to changes in your database schema without any down-time or having to write a single line of code. It's highly configurable but simple to use; Fine role-based security controls can restrict users from viewing or editing any data you like (prevent your clients from breaking stuff!). SQL CMS is an ASP.NET web application that configures itself to work with any SQL database by analysing the data types and data relationships in your database. 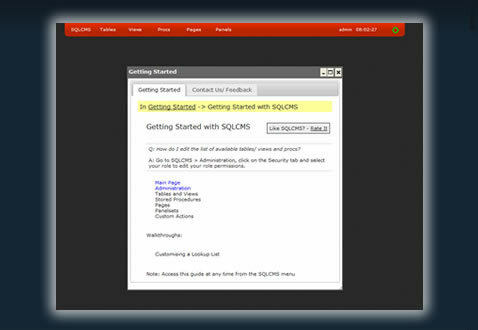 You can install SQL CMS yourself on your own webserver or create a hosted CMS on this website. SQL CMS is secure, fast and highly configurable. You can try SQL CMS for free. 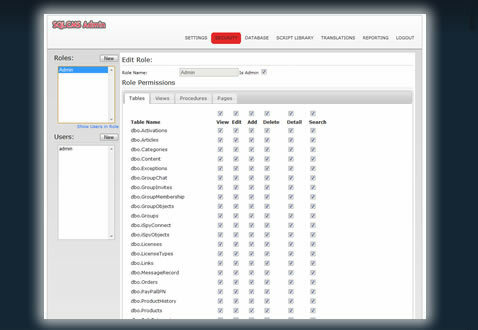 SQL CMS is currently generating over 2000 Content Management Systems a week. Check out the list below for a full feature summary. Available in 6 languages - English, Spanish, Italian, French, German and Chinese. 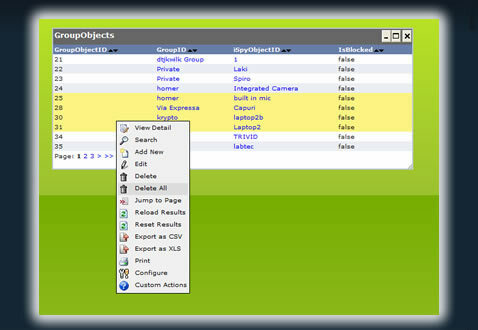 View, Search, Edit, Insert, Delete or Multiple Delete any data in your database. 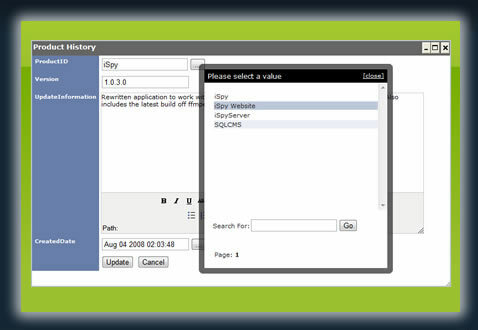 Adapts to changes in your database with no downtime. Export to Excel or CSV. 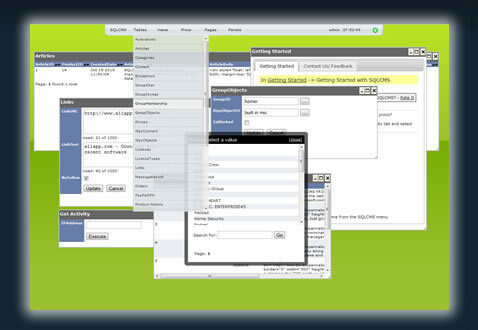 Built in Editors including an HTML editor, multiple format Datetime editor and file uploader. Add, remove and rearrange columns and persist settings through sessions. Automatic lookup list generation for data entry. 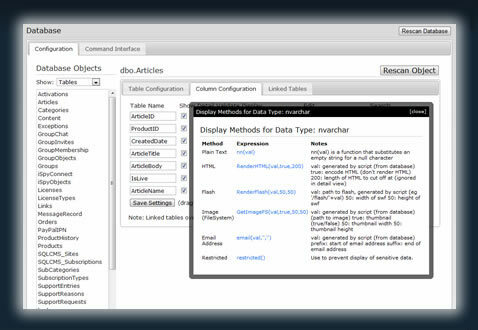 Work with any tables, views or stored procedures in your database. Can execute any stored procedure and renders output parameters and datasets. Create Custom Actions to pass any data from your tables directly into stored procedures, your own pages or other tables. Integrates with your existing site pages (install version only). Role based security with our built in encrypted XML user system or your existing database user/roles/groups structure (install version only). Prevent access to viewing or editing any data you like. Multiple themes, completely stylesheet driven. Daily reporting lets you keep track of everyone that is working with your data, by user and IP address.